This book is on my wishlist. I love how it sounds and the cover is great too though I don't like the girl's expression much. That book is most definitely on my wishlist as are those bookshelves now. They are awesome, but $2000?! Too rich for my blood. I can't wait to read this book! I saw those bookshelves too, but I agree with your hubby - way too expensive. I just acquired a small bookshelf from my mum. Nothing like free furniture. 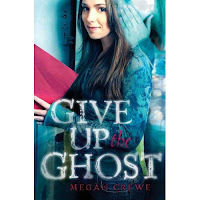 Give up the Ghost does look great. I love that the ghost isn't really obvious. Very cool. Lots of cool books coming out in September! Those book cases are AMAZING! Woah! Totally worth $2,000 :P Haha! Ha, those shelves look like the dancing furniture from Disney's Beauty and the Beast!